From preconception through preschool, nutrition plays a huge role in the outcome for moms and babies alike. I aspire to provide personalized care to every client, overcoming each case specific concern as we work toward achieving his or her individual goals for family feeding. This time period is key in establishing desirable lifelong habits, especially for the littlest members of the family. Positive changes, large or small, will collaboratively mold the lives of our future generations through redefining the outlook of what lies ahead. My hope is to provide the resources, knowledge, and skills necessary to assist those who aspire to make improvements and especially those who find it necessary to do so. Ultimately, a promising outcome is inevitable when passion and ability collide. 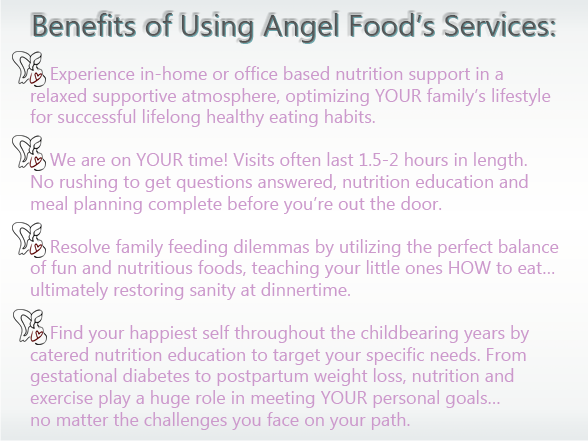 How Can Angel Food Help Me with nutrition?